My boyfriend requested a pair of comfortable shorts for lounging around on the weekends.What’s more comfortable than an elastic waist (says the woman who wears 90% elastic-waisted clothes)? I went looking for a suitable shorts pattern for him and only found one elastic-waisted non-swimsuit men’s shorts pattern: McCall’s 6972. I bought 2 yards of dark blue 100% cotton twill from Hancock Fabrics for the shorts. (He picked out the fabric, actually. I wanted to make sure I wasn’t making him something he would find uncomfortable or ugly.) The fabric is quite soft and has a medium weight. Twill was not one of the recommended fabrics, but he doesn’t like seersucker, broadcloth, linen, or chambray (the recommended fabrics). I was undecided about what size to cut, but I decided to go with the larger size, since I know he doesn’t like close-fitting clothes. That was a mistake! There’s about 10 inches of ease in the pattern. I didn’t realize how that would swamp him until I basted the sides together and had him step into the shorts. He then laid a pair of his regular, non-elastic shorts on top of the in-progress shorts. The size difference was dramatic. I should have chosen the smallest size, actually. So, I sewed the side seams at 1″, rather than 5/8″. I couldn’t bring myself to unpick the inseam, so I told him this version will just hang low. I think, for a future version, I might trace off a pair of his regular shorts and add a little extra width for an elastic waist. That might make for a better fit. The directions are pretty clear to me, although I’ve been sewing for a couple of years now. The pattern is billed as a “learn to sew” pattern, and it includes tips in the directions. A pattern-maker really needs to come up with a modern cut for elastic-waisted shorts for men. Simplicity has several elastic shorts and pants for women; do a little something for the guys who also don’t want to have a waistband cutting them in half! I love McCalls 6654. I’ve made it several times: in mustard, grey, black, brown, and now floral fabrics. Here is the floral version. My old tried and true! The elastic waist offers comfort, while the cut of the skirt is conservative, which I like. The instructions are also clear for this pattern, which is fast to sew up, even for a slowpoke like me! Usually, I use the lightning-bolt stretch stitch to sew this kind of skirt, but this time, I used the serger to sew the side seams and to finish the edge of the hem before I turned it up. I used the lightning bolt stitch to sew the waistband and to secure the hem. It has a lot of stretch. 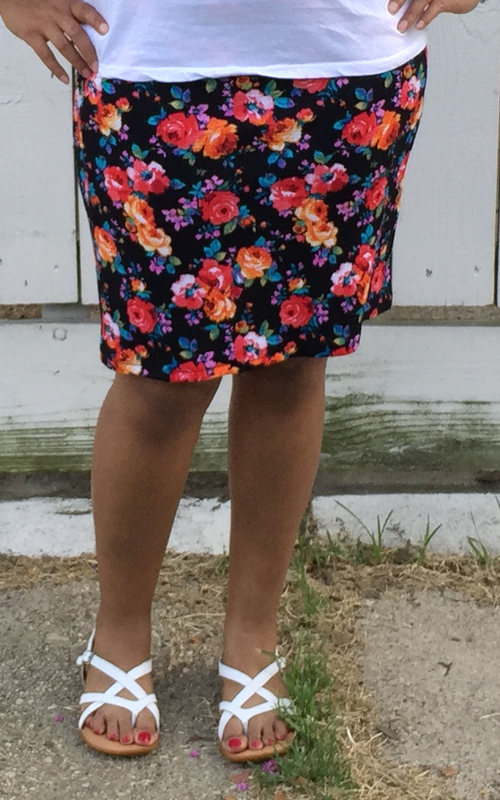 I feel stylish in this skirt…probably because this type of floral was in when I was a preteen. 😀 It looks like something I would have worn in the form of a slip dress (with a cropped t-shirt underneath, of course…even though I asked my mother to let me wear it with bare shoulders). I definitely recommend this pattern to others! Working on Stuff; Swing Dancing Outfits? Speaking of activities I enjoy, I have gotten back into swing dancing, now that I can physically do it again. I don’t have many going-out outfits anymore. I did several closet purges after gaining a lot of weight. What are some good patterns for dresses I can wear for a little lindy hopping? I prefer to wear sleeveless dresses that allow me to move. If you have any vintage or modern pattern suggestions, I would love to hear them!